Architects frequently take their design cues from nature, but while some prefer the curves of budding flowers or the sturdy power of desert mesas, others give their buildings reaching tentacles, high, squid-like towers, or the occasional smattering of what looks like suckers. Here are a handful of buildings and design concepts that remind us of the noble class Cephalopoda. This floating luxury resort will containe offices, a marine park, underwater marine galleries, a central tower with a panoramic restaurant, and floating waterways. 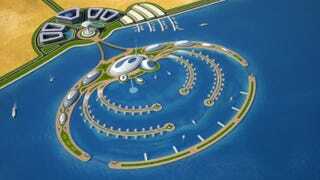 The tentacles will feature 80 floating suites complete with underwater viewing decks. This business building, opened in 2009, is very similar to the Selfridges Building in Birmingham, UK, but it has a cheerful octopus form. This Phnom Penh landmark Art Deco building was constructed in 1937. Before 1935, the area was a lake. During the Franco-Thai War, Thai aircraft bombed the market, forcing it to temporarily close, and after the end of WWII, the four arms were rebuilt. This office building was designed by MAKE architects in 2009 for the Chiswick suburb of London. It will be open by the spring of 2015. In 2007, the famous architect Jan Kaplický won the design competition for the Czech National Library with his design named "Eye Over Prague." The project was targeted for completion in 2011, but was cancelled in 2008. Kaplický passed away in 2009. This building has 9 floors, 200 study areas, an underground depository that holds up to 10 million books, and a system for delivering a book from the depository to the librarians within 3 minutes. Designed by the Chinese PTW Architects, and built between 2000 and 2009, this is a super 5-star luxury hotel with 180-degree ocean view suites and an underwater restaurant. It will open in 2013. The tentacle-like temporary PVC tents with red, blue, and pink ventillation circles will make its next appearance in the Commonwealth Games 2014, in Glasgow. The brilliant Zaha Hadid designed this tentacular building as a proposed community center for Elk Grove, a suburb of Sacramento.